You know that term, “party animal?” Well, we think it is high time to upgrade it and start a new trend. Why not try on the label “party insect” for a bit? No one knows how to party quite like a bee. You don’t believe us? Think about it for a minute. Bees are never found just hanging at home solo. Bees don’t binge watch Netflix; they are always buzzing around from one place to another, collecting sweets and stopping to smell the roses. Bees are also one of the few creatures that communicate by dancing, just like you! 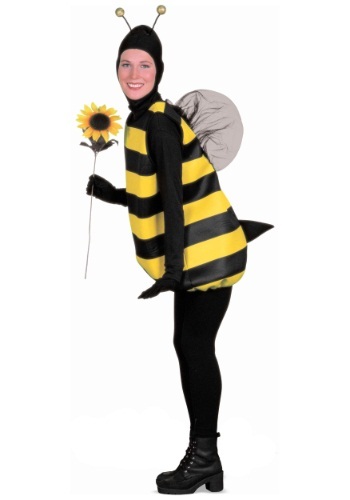 You can show everyone just how much you know about bee behavior (along with some special bumble bee moves) in this costume, although we're not actually sure if real bees know how to do the jitterbug like you do. Pity. That would be cute. This outfit does have black and yellow stripes though, so you can be sure to fit in with all the other party insects at the hive. Along with the cute jumpsuit, you get an adorable little set of mesh wings to flit about in. The black headpiece ties under your neck and gives you fuzzy antennae at the top so you can put yourself out there like the party insect that you are! The buzz is there’s a big soiree down the street later on and they’re looking for someone to warm up the dance floor; go on, honey!